Remember Amazon App Treasure Hunt Happened in Last Previous Months . Its Back Again And this Time With More loot And More Fun On Many Products With Amazing Deals For Free On 28th September With New ClueEvery 15 minutes between 3 pm to 6 pm. Find can find all Updated Clues Answers On this Page Once The treasure hunt Will Go Live On 28th September. Clue 4:30 PM- Inside a null Set &On your bed. Blockbuster Clue : My hepa, clears what one must, leaves behind anything but dust. 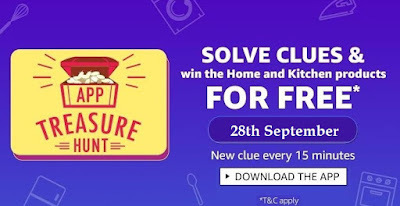 0 Response to "Amazon App Treasure Hunt 28-29 September : Find Clue Answers And Get Free Home & Kitchen Products"